I was the first to hear your heart beat. The first to see your face! You brought so much laughter and love no one can take your place. The bond we have no one else has, for it is only given to a mom. The laughter, the pain, the joy you felt, you could never hide I could always see it in your eyes. Somehow I wish you could have seen what I saw The baby boy that grew up to be more than a mother could ever ask for. Though the distance be far, I feel you so near with each beat of my heart. I see your smile in each star at night. Your voice so soft in the breeze. Your touch wiping away each tear. My son taken to soon but a love that will continue to grow each passing year. You are my Special Valentine and in my heart you will always be, for no one can take that away from me. 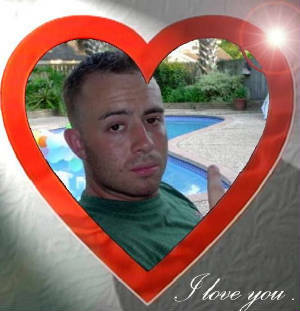 Send a Velentine Message to Dustin or to a loved one you have lossed. Let them know they are always in your heart. to our children in heaven now reside. And take them to their sides, and gently lay them there. All our lonely aching while we are apart. Let them see this, our valentine to them above. when we hear them whisper our names. And with us they will always abide.